I’m reading James Kelman’s How Late It Was, How Late and although I’m fascinated by it, I’m finding the Glaswegian dialect hard work and not suitable for late night reading before bed. 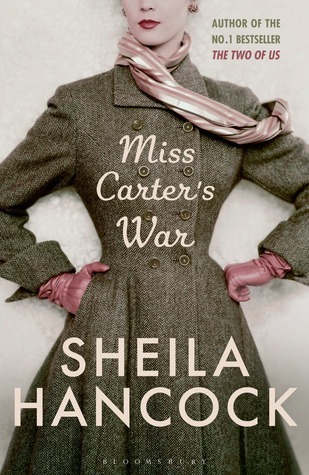 I thought that Miss Carter’s War would be suitably undemanding to read, and I was mildly interested in the adventures of a heroine of the French Resistance adjusting to life in post-war Britain. But the novel fails to make good use of a promising concept: in Sheila Hancock’s hands it’s a rather mediocre story which has been allowed to succumb to a Grumpy Old Author Getting Things Off Her Chest. The novel works its way through the life of Marguerite Carter, a mildly left wing school teacher of Anglo-French extraction, who was, somewhat improbably, sent by the Brits to organise the Maquis resistance in the Vaucluse region of France during WW2. Drip fed her memories of various atrocities, the reader gets a vague impression of these activities but never really finds out much about this, except that she holds a torch for ‘Marcel’ even though she chose not to stay with him after the war. This leads to the conclusion that the ‘war’ of the title is a war of a different kind, as indeed it is. Miss Carter is on a mission to change the world: she wants to prevent social injustice, prevent war, and educate young people. With a degree from Cambridge, Miss Carter starts out her career as a reformer in a grammar school and becomes a gifted teacher (of course, despite having no teacher training). But inspired by her dreams of social justice she decamps to a shabby comprehensive, accompanied by her great friend Tony. He, alas for her, turns out to be gay, but she values his companionship so much that it take years for her to take on another relationship, this time with a man so obviously too-good-to-be-true that it is no surprise at all when he turns out to be a complete dud. The plot perks up a bit when she finally (finally!) sets off for France to exorcise her ghosts, and oh dear, yes, there is a completely improbable happy and contented ending. This novel is a classic example of the I’ve-always-wanted-to-write-a-novel syndrome that grips some people in retirement, deluding them into thinking that they can take up professional writing without having spent a lifetime developing their craft. While there are wonderful exceptions of what Sue at Whispering Gums calls Late Bloomers, Miss Carter’s War isn’t one of them, and IMO it wouldn’t escape the slush pile in any publishing house were it not for the author’s profile as an actor. Carole Mansur at The Telegraph found more to like than I did. I quite enjoyed Ms. Hancock’s memoir of her life with John Thaw. It’s a pity she couldn’t make a better fist of this debut novel. I think Dawn French might fall into this category too. I haven’t read the memoir, but I suspect I might have liked that too. I’ve read a couple of memoirs by actors and liked them, but a novel is a different beast. Sounds like one I’ll give a miss, Lisa …. It’s the sort of story that would have interested me too. It got me thinking, Sue … do you know of any successful stories about teachers? I can’t think of any! Hmm … I guess it depends on what you mean by successful. I loved To sir, with love, but I read that as a teen. I have no idea what I’d think of it now. And then of course there’s Goodbye, Mr Chips, but I don’t think I’ve ever read it – just saw the movie. Ah, what about Lloyd Jones’ Mr Pip? I haven’t read Charlotte Bronte’s Villette but I think it’s semi-autobiographical about her experience as a teacher in Germany? I’ve read Tom Brown’s Schooldays, but can only remember that it was forgettable, and I’ve reviewed Goodbye Mr Chips here, LOL only to warn people off it. I don’t think I’ve read or seen that, though I remember the title. The other one I meant to mention yesterday is The prime of Miss Jean Brodie. I think there are others but that’s all from the top of my aging head. Oh yes, of course, Miss Brodie! It’s a pity. There are more than a few women who did amazing things during the war – Nancy Wake for one – and I suspect that the story of the life that came afterwards would make interesting reading. But what would make it interesting would be the way the author handles the transition back to ordinary life, especially for women who must have found being ‘sent back to the kitchen’ challenging, to say the least. What a wonderful coat on the cover though. Yes, it’s a great cover. One of the things Hancock does quite well in the beginning is the descriptions of the clothes. My mother was a young woman in London after the war, and she has sometimes talked about how wonderful it was to have enough material for wide skirts after the rationing ended. There’s a rather droll scene where Marguerite ditches her newly glamorous outfits for the sort of dowdy outfit that was suitable for a job at a girls’ school! Rationing went on for years after the war, Glen, in part because Britain had to contribute food to British Occupied Germany. It was still in force until I was a toddler and my mother remembers that eggs were still rationed to one per week when my older sister was born. If you wanted to make a birthday cake, you had to save them up or swap around with the neighbours. My sisters and I have very good teeth because sugar was one of the last items to come off rationing! Clothes rationing went on till 1949. One thing that Hancock doesn’t mention (unless I missed it) was the post-war housing shortage. People say that the Brits were racist towards the immigrants flooding in from all over the Commonwealth and perhaps they were, but when whole families were living in single rooms because so much housing had been destroyed in the Blitz, it was not surprising that the Brits resented competing for whatever was available with the newcomers, who – with much larger families – also had to crowd into cramped and dingy living spaces. To give you an idea of the pressure on building materials and tradesmen, in the mid 1950s my grandmother still had an unrepaired hole in the roof from bomb damage. Post-war austerity accounts for some of the emigration to countries like Canada and Australia. My mother says that she couldn’t wait to leave Britain, she did not want to live in a country that couldn’t feed itself. Thanks so much for your recollections, Lisa. I also remember reading about the wartime dances that persisted for sometime after the war. The author (whoever it was) was saying that, once the war was over and the dances themselves were no longer last-dances-with-whomever-before-they-left-for-the-front, none of the dancers wanted to talk about the war in the way that they had while it was still on. Then after a little while, maybe a couple of years or so, the dancers started talking about the war all over again. In other words, a strange of cycle of blocking out and nostalgia ensued. Two more things spring to mind. One comes from Hancock’s book on Thaw, in which she mentions in passing that the divorce rate spiked after the war, when couples who barely knew each other after six years of fighting tried and failed to cohabit adequately. The other I know from my exposure to old motor cars (a family preoccupation): the rationed fuel was known as Pool Petrol, and had such a dismal octane rating that it was impossible to make cars with even the most modest performance pretensions run properly on the stuff! I think Pool persisted until 1951 or 1952. Don’t know if the coupon system did likewise. It certainly puts today’s austerity into perspective, eh? Thanks Lisa. I had this on my radar but will now give it a miss and bump up Moondrop to Gascony written by a real SOE agent.